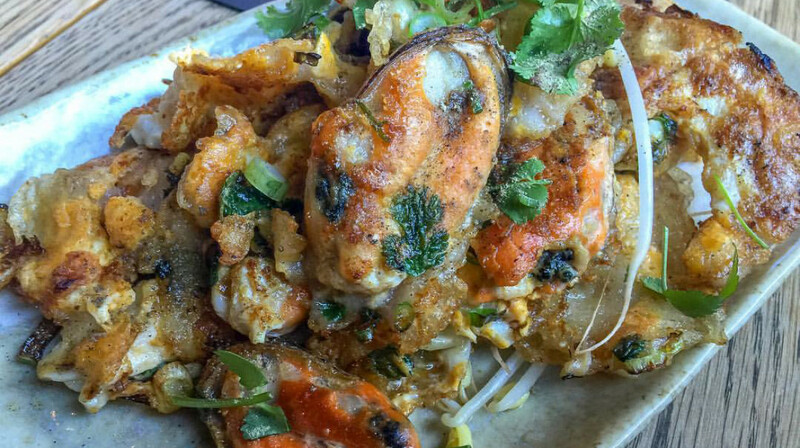 Thai street food comes to Christchurch. 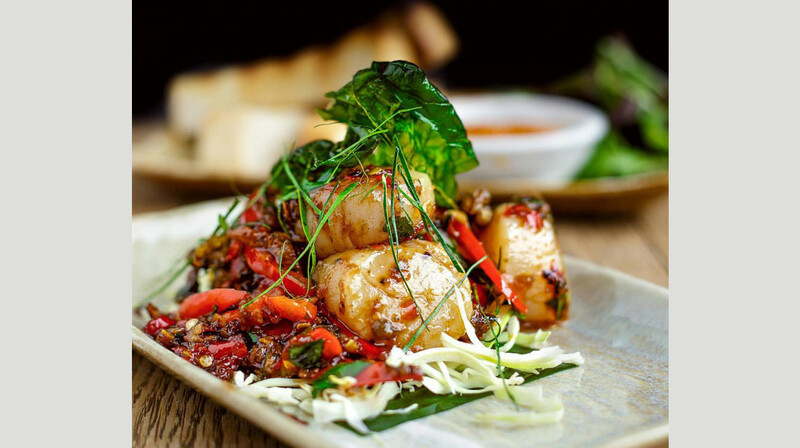 If you’ve never had Thai street food before, let Tuk Tuk take you on a culinary journey through the vibrant streets of Bangkok. 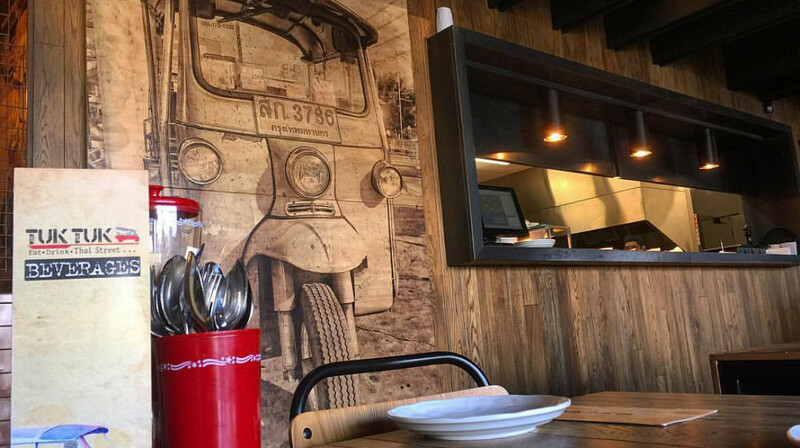 We serve up the sights, smells and flavours of street-style cooking from the heart of Riccarton! 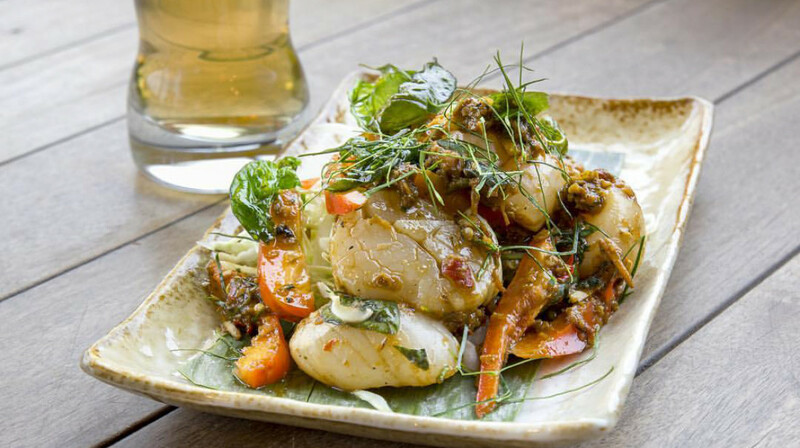 Tuk Tuk’s signature dishes include Yum Tuk Tuk Pork with Roasted Peanuts and Lemongrass; Kaeng Som Curry with Thai Prawn Omelette; and Larb Kai Spicy Chicken Salad. 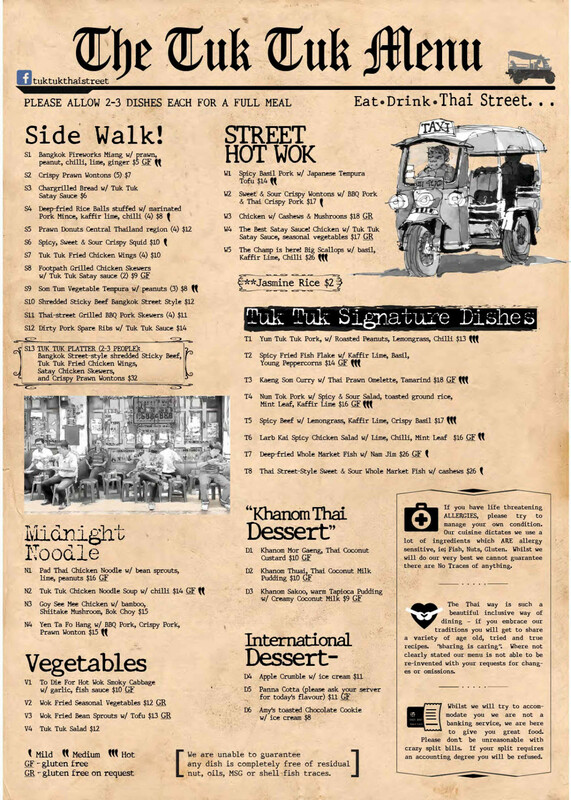 The Side Walk menu offers a mouth-watering selection of tasting dishes straight off the bustling streets of Bangkok. 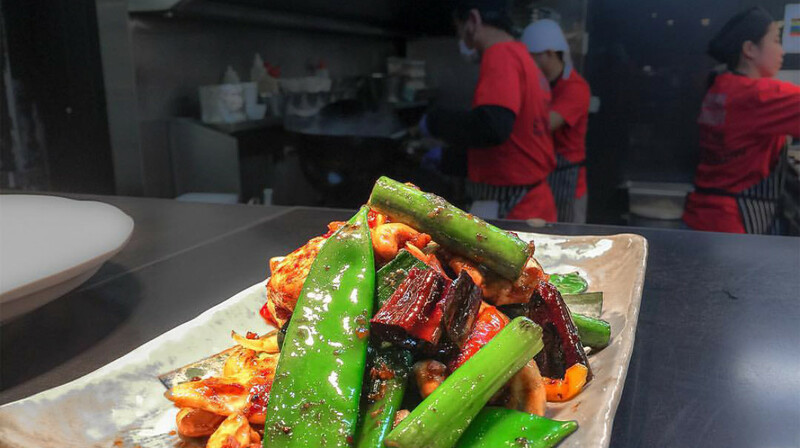 You’ll find larger meals on the Street Hot Wok menu. 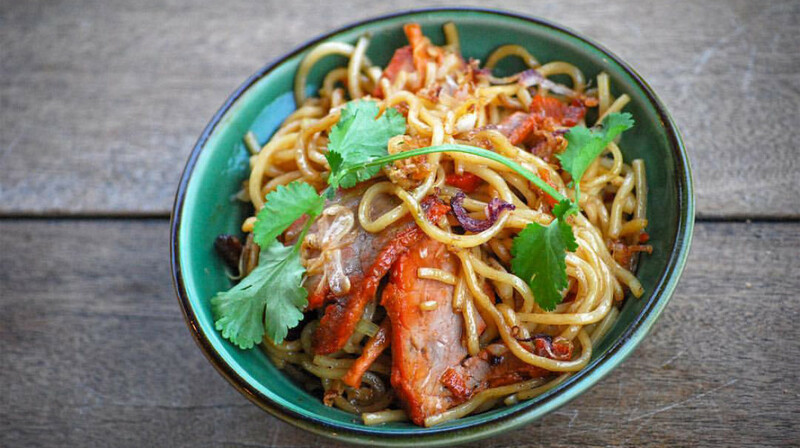 Vegetarian favourites include the Hot Wok Smoky Cabbage and Wok Fried Bean Sprouts with Tofu. 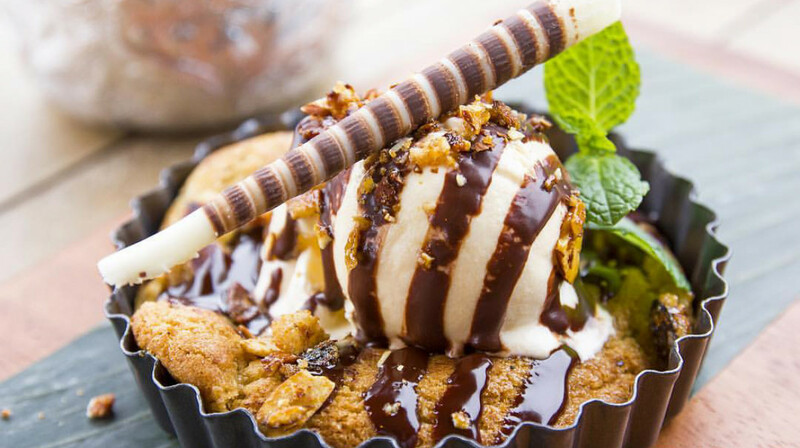 As you’d expect their dessert menu is full of rich, coconut-flavoured delights. 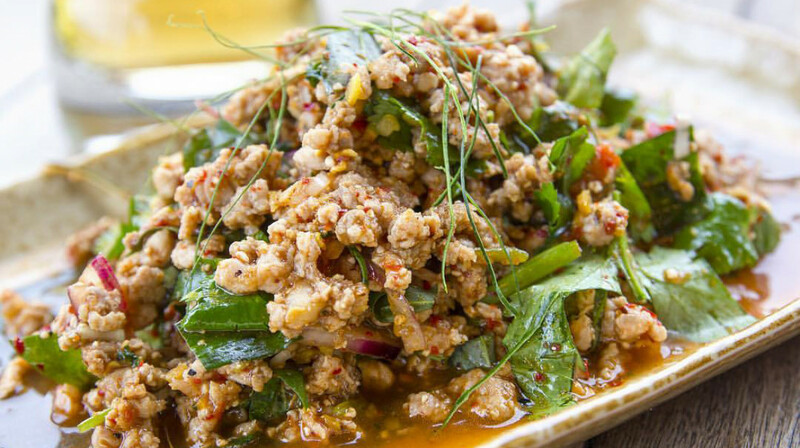 If you’re looking for toned back Western-style Thai food, this is not the place for you! 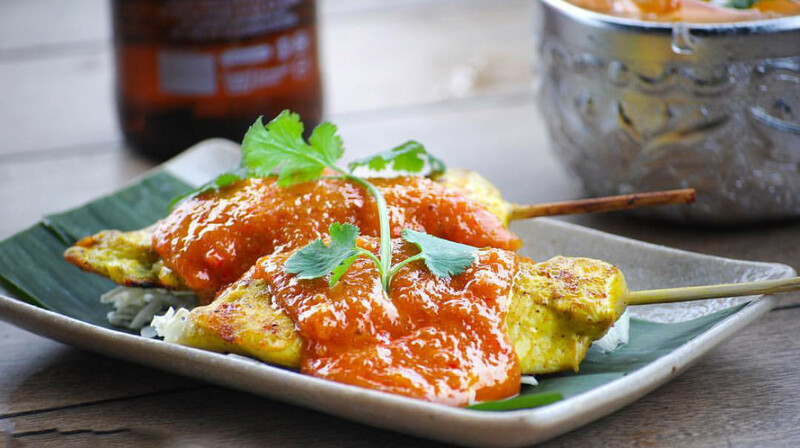 Instead, be prepared to taste the atmosphere and flavours of real Thai street food. Nice setting. Food was quick. Good time! We are regular dinners to Tuk Tuk Thai. We have always found the quality of food to be very high, and the service by the same friendly and accomodating staff exceptional . 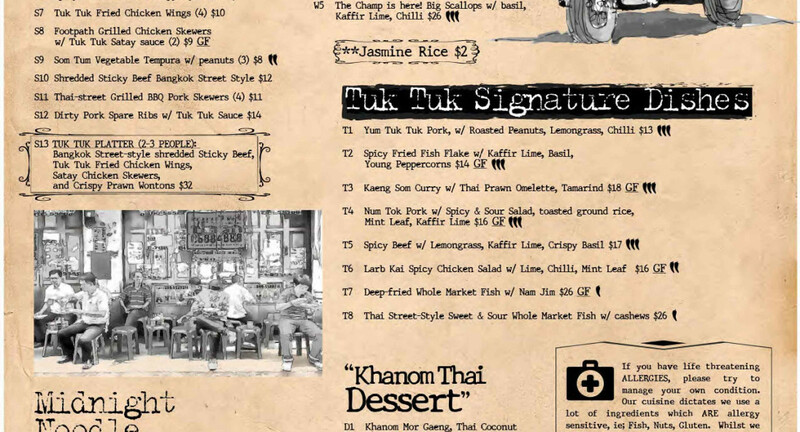 Thank you again Tuk Tuk Thai for a lovely meal. .
Amazing food with amazing service! We love dining here and every time it does not disappoint! 5 stars for me! Amazing food - generous portions and no long wait from order to food on our table. Helpful wait staff. Would most certainly go again! Excellent service, is excellent food! Yummy food with great service. The pad thai and currey are delicious. Best Thai we've had in a while, really authentic with loads of fresh herbs added. Have dined here before. The food is always amazing- can’t recommend it enough! The platter to start was out of this world! This place is great!! Its fresh, fast & super tasty. The chilli beef was AMAZING i couldn't stop eating it & as for the rice balls.... so much flavor. We had an excellent time. The waitress was prompt and polite. The food came out quickly and was flavoursome. We will certainly be coming back! Amazing food and great service. Love going here! Dine here last night for my birthday, service is excellent, the lady at the front is really helpful of choosing the popular food at their restaurant, the atmosphere and food was good. Had a truly delicious meal which tasted so authentic!! So fresh and flavoursome! The service was impeccable! Very attentive and happy to oblige. Very prompt service. Would definitely go again!!! Food was yummy. Would definitely go back for some dishes. The best Thai street food, happy tummies as always! Food was excellent, service was excellent. Had a great meal, and the pricing was really good. I would highly recommend Tuk Tuk Thai Street Food. 4 of us dined there food was really great and tasty, and service was perfect. First time we have been here. Was not impressed with the food at all. Meat was dry and tough. Our son ordered Chicken Satay dish, when it arrived it was full of vegetables with barely any chicken. Would not return. 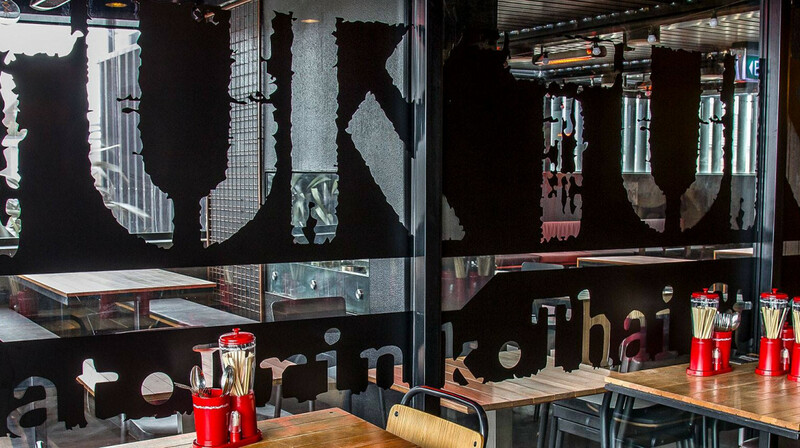 We loved our meal at tuk tuk! Everything was very tasty and fragrant, we would love to dine again! Fantastic! I had a great time. Great food and service - thanks! Food was great. Nice selection. Staff very friendly n welcoming. Food comes quite fast n it was delicious. Our dessert was ice cream with sago pudding which was nice on it own. We would have preferred however to have larger portion of sago pudding without the ice cream as that is more Thai n something which we love. Great food and service. Definitely recommend. Awesome dining experience. The staffs entertained us very well with detailed description of what the menus are. The foods we had were absolutely yummy! We'll surely come back to dine there. Not the expected Thai style for us. Awesome service and meals came out quickly. Entrees and mains were perfectly cooked and very tasty. Good large portion sizes. Nice place - good food and service. Recommended. We ordered the chicken pad thai, eye of the tiger and the green curry. All were delicious! 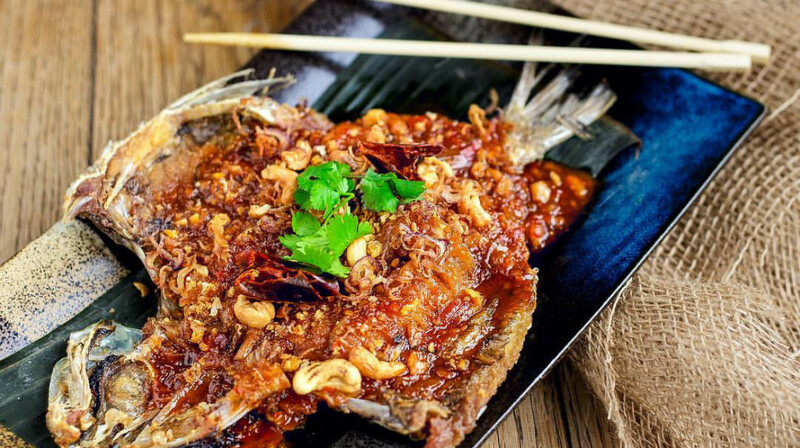 The portions are generous and the food is flavoursome and spicy! 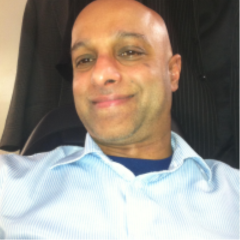 The staff were helpful and attentive and our meals came out very quickly. 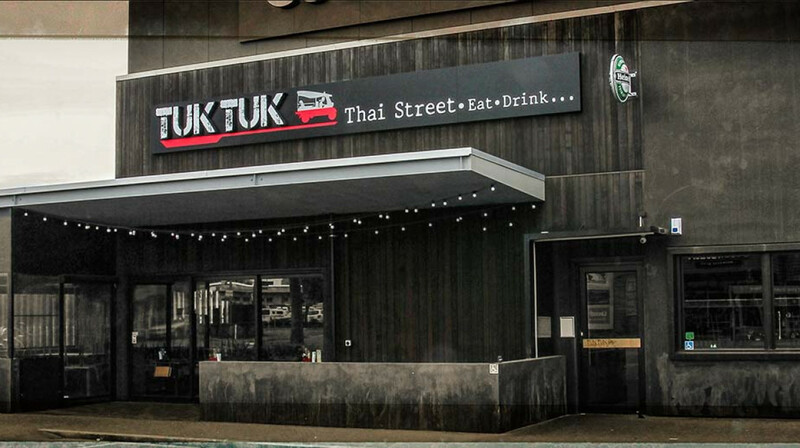 We enjoyed dining at Tuk Tuk and will definitely come back again to try the rest of the menu! Great food, great service. Loved the presentation of the pineapple rice. Will definitely be returning. 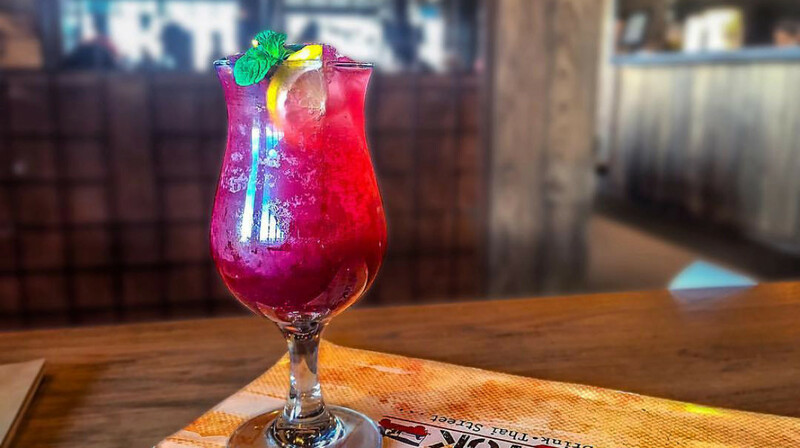 Delicious food and friendly, efficient wait staff make this out favorite restaurant in Christchurch! Delicious, tasty food. Friendly staff, good service.